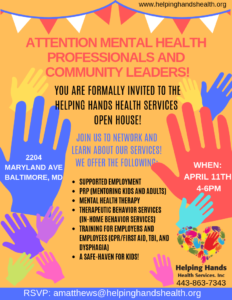 Helping Hands Open House- April 11th from 4-6pm! – Helping Hands Health Services, Inc.
You are invited to the Helping Hands open house on April 11th from 4-6pm. Join us to learn about our expansion and the services that we provide. You may RSVP using our official Eventbrite link here or send an email to amatthews@helpinghandshealth.org.